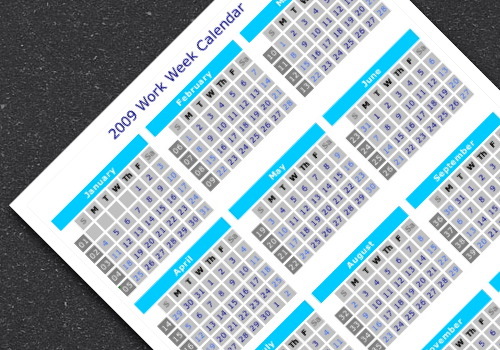 *UPDATE: The calendar has been updated for 2010 and is available for download here: 2010 Work Week Calendar. Several individuals found the 2008 Work Week Calendar useful, so I’m being proactive and posting the 2009 Work Week Calendar a few weeks early. As I mentioned before, this work week calender is based on the badge-sized calendars that my previous employer used to hand out. Please note that January 1st marks the first work week of this calendar, which isn’t ISO 8601 compliant. The only difference in this case is that the last week of December is shown as work week 1 of 2010 instead of work week 53 of 2009. Regardless, you’re more than welcome to change the last week as you see fit. I have also included a candy bar style calendar based on David Seah’s Compact Calendar, and as always this calendar is completely free to download and use. For 2009, I’m providing an Excel version, an iWork Numbers version, and a PDF version so hopefully no one gets left out. Feel free to modify the calendar any way you like, and be sure to relay any mistakes or corrections I may have missed. Another difference between your calendar and ISO 8601 is that a new work week is supposed to start on Monday, not Sunday as you\’ve shown. So for example, Sunday 4th Jan 2009 should be part of WW1, not WW2., shouldn’t it? @Tom Joy – Yes, that is correct—Sunday January 4th, 2009 would be part of WW01 in an ISO 8601 compliant calendar since the work week starts on Monday. Thanks for the great calendar! You just saved me a ton of work, although, I was looking for something like the first calendar, but now I really like the Candy Bar calendar a lot more. Regardless, I really appreciate it. @Brian – You’re welcome, and glad to hear that it saved you some work! The Candy Bar style calendar is especially nice since it has extra room for important notes, that’s why I had to include it since it was such a great idea and design by David Seah. Thanks for providing this. I’ve downloaded 2008 one previously and found it really useful. do you have already the calendar for 2010? What a joy to find this on the net. it’s saved me a load of work. I’m running a couple of businesses in Brazil and nothing like this exists here. For the vast majority of Brazilians, there are four weeks to a month and twelve months to a year so 48 weeks to a year. Would you believe it, even some University Professors come up with this figure? Anyway I can easily adapt in Portuguese. Thanks again!! @Michael – I’m glad to hear that the calendar saved you a load of work, and that’s interesting to hear that a majority of Brazilians consider a year to have 48 weeks! @Griffin Rees – Sorry to hear that the calendar did not meet your needs—also, I would be more than happy to try and incorporate any feedback you may have to make the calendar better—just let me know! Thanks so much for this! I just found it via Google and it’s exactly what I needed to help me build a document at work. I hope you’ll do one for 2010! Venkat: Thanks for Very useful calender planner, which i am using for aircraft maintenance. Is it possible to get the candy bar weekly calender in row. Cool, hope to get the one for 2010 as well. When will you have the 2010 work week calendar available? Tks for the 2009 calendar week, it is very useful to me ! @BJ, @Cindy – I’m swamped with work and life at the moment, but will definitely aim to have the 2010 calendar posted by November. Just wanted to say thanks, I order from a lot of manafacturers who quote their delivery in terms of weeks. Up until now I’d been using a mouse mat with the weeks on it (which I’ve misplaced), and I have just been huffing and puffing for the last 10 minutes and had resigned myself to have to count the weeks. But now thanks to the power of google – I have been saved an extremely boring task, I’ve even downloaded your excel spreadsheet and actually put in into my orders & delivery spreadsheet, so I am no longer reliant on the mouse mat. Found your calendar through Google. Our office and clients use the week calendar to schedule projects but for some reason documents like yours are hard to find on the web. So thanks! Thanks for the 2099 work-week calander. When will you have the 2010 calander? In the UK and other EU countries, week commencing December 25th 2009 is week 53, with week number 1 starting w/c 4th January 2010. This for accountancy and payroll purposes. Most calendars I have seen so far class Jan 4th as week 2. Hey there, I wanted to thank you for the 2009 calendar you made. It made my life so much easier all year. I’m hoping you’ll come out with a 2010 version. Few free online calendars come with the week numbers included. Once again, thanks and I hope to see a 2010 calendar soon! Using your 2009 ww calendar, I have prepared 2010 calendar. let me know if I can share it with you. Thanks Bud, have a great 2010!! Brazilian folks appreciate!! Thanks for sharing your 2009 calendar. Great work!